"It is very hard for me to overstate how much of an impact the EEI has had on my life"
"The EEI has been an amazing time for me. It has helped me to understand the call of the evangelist. I warmly recommend EEI"
The EEI team converged on the city of Blackpool for this instalment and focused on ‘The Evangelist and the Church’. This gathering was held alongside the Lancashire Festival of Hope which offered some fantastic applied learning for participants as they came alongside local churches. They helped promote the event around the city each afternoon, counselled those making decisions for Jesus at the event each evening, and went behind the scenes with the BGEA team to see a good portion of what goes on before and after the event in order to get people connected and discipled in local churches. In addition to all of this, we also took in some great teaching and insights from guest speaker Rick Oldland of The Well Community Church, as well as from Martin, Glenn and Gareth from the leadership team, and outgoing graduate Tim. Lastly, we celebrated the graduation of not only Tim, but also Ricky, Pam, Lorna, Jimmy and Jason. Please pray for each of them as they continue to boldly share the love of Jesus as they go! 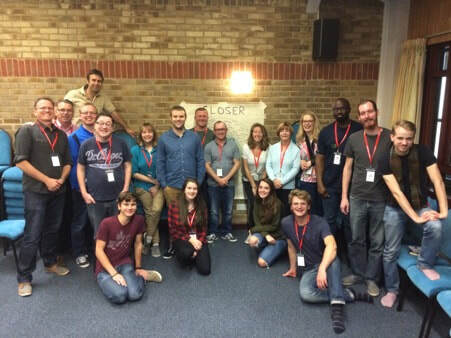 With three more evangelists graduating, and a few more joining EEI for the first time, we had a great weekend in Northampton exploring the theme 'The Evangelist and Communication'. It was brilliant having Mark Ritchie (73rd Trust) with us for a whole day, leading us through the ins and outs of the evangelistic message preparation and delivery. The weekend also gave opportunity for every participant to preach for 5 minutes and then receive constructive evaluation of their gospel preaching. Never easy in front of your peers! Please pray for these evangelists as they grow in their call, and particularly for Ann, Robbie and Raymond who graduated EEI this time around. This was arguably one of our best EEI training modules to date. 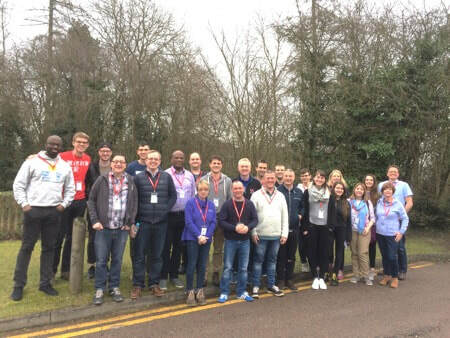 With some exceptional speakers and an increased participation, we had a challenging weekend looking at our present culture and how, as evangelists, we engage such with the life transforming message of the gospel. With participants from England, Northern Ireland and Scotland, it truly was a rich occasion of seeking God together and each one left with a renewed determination to fulfil the call upon their life. Back in Northampton, the module 'The Call of the Evangelist' took place this spring. With several new participants joining, and two graduating (after now completing all four modules), we had a fantastic time exploring this topic. We were particularly blessed to have Jill Garrett, and then Mark Greenwood, helping us unpack this foundational teaching. 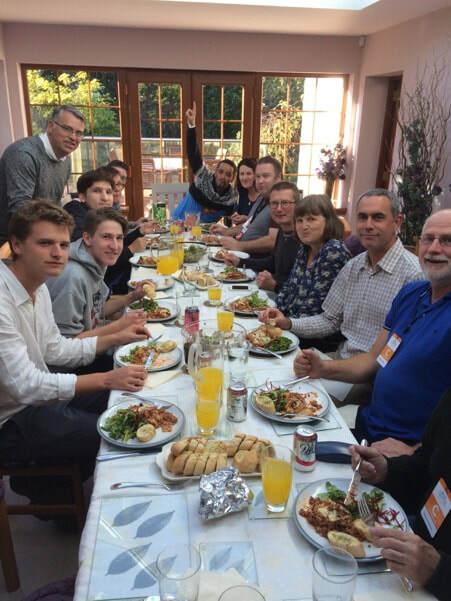 Please pray for the evangelists in training, and particularly Samuel and Martin who graduated this time. For the most recent EEI training residential, we had the brilliant opportunity to base ourselves in Peterhead, Scotland. 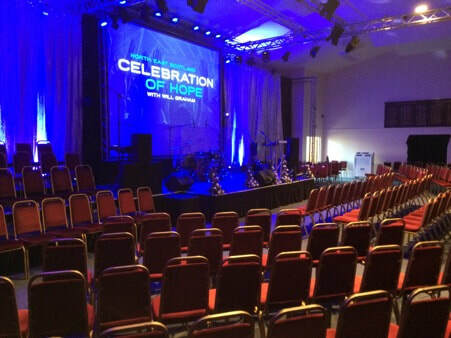 There we partnered local churches and the BGEA in the 'Celebration of Hope'. 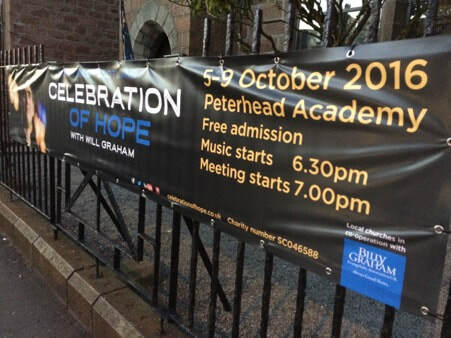 This was a 5-day evangelistic mission seeking to impact Peterhead and surrounding towns in Jesus' Name. Will Graham preached the gospel each night calling precious souls to surrender all to Jesus. The EEI evangelists (a team of 18) spent these days receiving teaching, out and about on the streets seeking to share Christ, and serving at the evening preaching events. It truly was an inspiring occasion, perhaps best summed up with news that one month later we heard that 23 people were baptised on one Sunday alone as a direct result of the mission. Praise God! "We are VERY sorry to be leaving Scotland and Team EEI. What a fantastic week in so many ways"
We had a great weekend of EEI training in mid April. The theme was 'The evangelist and communication' and we enjoyed grappling with this critical aspect of the evangelist's call. Guest speaker Mark Ritchie really helped sharpen our understanding of communicating the Gospel and several participants testified to having changed thinking as a result. We were also delighted, and blessed, to have input from Helder Favarin. Helder is the leader of Red Timoteo in Spain, and a former EEI UK graduate. His insight was refreshing and challenging. All left the weekend with renewed energy and expectation of God! Mark Ritchie is a talented communicator of the Gospel, who has travelled all over the world communicating about the cross. He mixes effortlessly funny storytelling with a passion that has impacted tens of thousands in a powerful way. The main vehicle for this is his one-man shows. Through stories collected from all over the world he makes people laugh and think! He also has the privilege of speaking to churches across the country drawing from his own personal walk with God. His attitude that God desperately wants to connect with us comes through in whatever context he finds himself speaking in. People describe Mark as refreshing, humorous, passionate, relevant, creative, and dynamic. Hélder Favarin is an evangelist, missionary and pastor. He’s the director of 180º Global (180global.org) and of Festival 180º (festival180.com), which he co-founded with his wife Ana. He is also the founding pastor of the church "Capítulo 29" in Granada (c29.es), a prominent university city in southern Spain. He is a founding leader and coordinator of RedTimoteo (RedTimoteo.org), a program for young evangelists in Spain. Hélder is a board member of Mission-Net (Mission-Net.org), a European-wide youth movement and congress commissioned by the European Evangelical Alliance (EEA) the European Evangelical Missionary Association (EEMA). ​Greg Haslam is Minister of Westminster Chapel in London. He travels widely as a Bible teacher, conference speaker and writer. He has a real heart to bring Word and Spirit together through a biblical theology that is on fire. He desires to see the widespread emergence of healthy churches that can become a credible voice to our declining culture. This requires an informed and vigorous depth to their faith, and a dazzlingly different life-style in marriage, home, work and Christian community. He is married to Ruth and they have three grown-up sons and five granddaughters and two grandsons. He is the author of many articles and books. The latest include ‘Preach the Word!’ (Sovereign World), ‘A Radical Encounter with God’ (New Wine Press) ‘Moving in the Prophetic’ (Monarch Books), ‘The Man Who Wrestled With God’ (New Wine Press) and ‘The Jonah Complex’ (River Publishing). He has also contributed to ‘Should Christians Embrace Evolution?’ (IVP), and ‘101 Great Ideas for Growing Healthy Churches’ (Canterbury Press). ​Gary Gibbs is the National Director of Evangelism for the Elim Pentecostal Churches. A gifted and inspirational communicator, Gary has been in evangelistic ministry for more than three decades. As well as preaching nationally and internationally, he has also been a church planter and was for many years a leader in a significant church in the city of Derby. 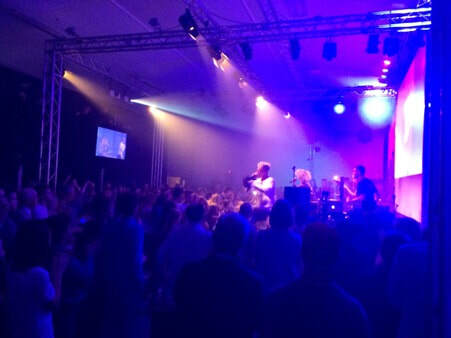 Much of his time these days is taken up with communicating the Good News of Jesus Christ as well as training, equipping and mentoring others. Jill Garrett is Assistant CEO at LT Consulting and is recognized internationally as an authority on leadership development, leading change and the effective use of strengths. Her extensive coaching and Executive consulting has helped to bring clarity of direction, renewed engagement and improved organisational performance in a commercial, governmental, charitable and church based organisations. She has had considerable experience in training experienced coaches to use assessment tools. Her passion is to enable others to recognise and realise more of their potential and so contribute to improving the lives of others. Jill is an active member of her local church and her work with the Church includes projects with Care, World Vision, Liveability, Youth for Christ, Diocese of London, Diocese of Coventry, Diocese of Bristol, Open Doors International, YWAM, Tearfund, Regent’s Theological College and Soul Survivor. ministry team of two churches helping them create an evangelism pattern and culture. Mark travels around the UK speaking evangelistically as well as equipping local churches and Christians in effective evangelism. He heads up the evangelism in his own church implementing locally what he helps churches across all denominations nationally. He is known as an Evangelist who presents the gospel in a humorous and engaging way. He inspires and equips Christians to feel they can share their faith and not simply that they must share their faith. He is passionate about the local church and wants to do all he can to help them to become all they can.